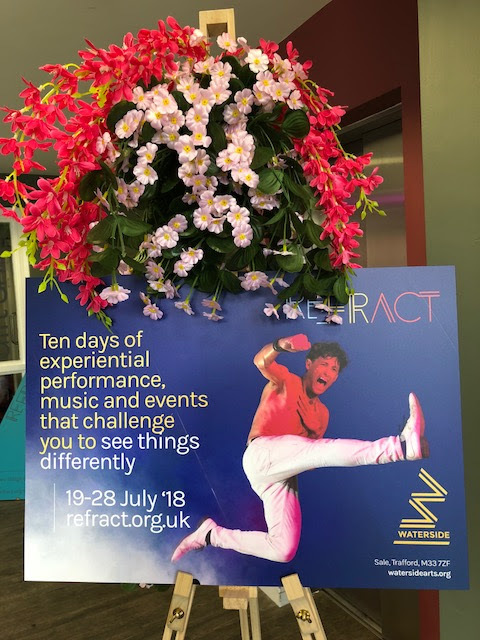 Refract is back at the Waterside Arts Centre for a second year after a sensational debut last year. How can I forget the mesmerising, gravity-defining antics of one man on a trampoline that was Anyday! Refract is all about looking at things differently. We chose to watch Small Worlds - a compilation of 5 interwoven stories played out as miniature theatre under a canvas dome. We were an audience of not more than 20 children and adults, seated just a couple of feet away from the miniature stage, in what was a very intimate setting. The two puppeteers/animators moved props, adjusted stage lighting, created sound effects and made sure the animated film synced seamlessly with the wooden puppets in the foreground. A butterfly and a red balloon were the thread that linked the stories of a bug, a goose, a fox, a cat and a little girl. The concept of Small World was novel, and I can appreciate the enormity of the effort that must have gone into bringing it to life. The entire set, all the puppets and props were handcrafted. The animation and sound was done with ingenuity, and as we got told at the end, on a budget. The thing that troubled me was the narrative. I think it was too abstract and slightly placid to capture the imagination of young children. The miniature nature of the production and dim lighting made it difficult to stay focused. There was plenty of fidgeting, not unusual with children’s theatre, but the intimate setting magnified it immensely. That said, once the lights came on, it changed the dynamics in that tent. The presenters explained how the puppets moved and encouraged questions from the audience. The children were instantly attentive, curious and wanted to know more about the production. Refract is about breaking conventions and runs at The Waterside till the end of this week. There is still time to grab some tickets and have a go at looking at things differently. Disclosure: We were given tickets to watch the show in exchange for a review. All opinions are my own.